A Zephyr under cabinet range hood that vents smoke and odors efficiently, this 36-inch model has a simple, pleasing design in stainless steel or other colors to match your kitchen décor. The 3 fan speeds work quite well and not too noisily. The set comes with incandescent lights, but you have the option to upgrade to brilliant halogen lights. We wish the filters were dishwasher safe, but the hood’s ventilation is quite effective at 250 CFM. 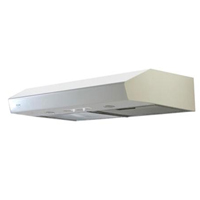 For $210, this Zephyr range hood provides more than adequate performance for a fair, affordable price.